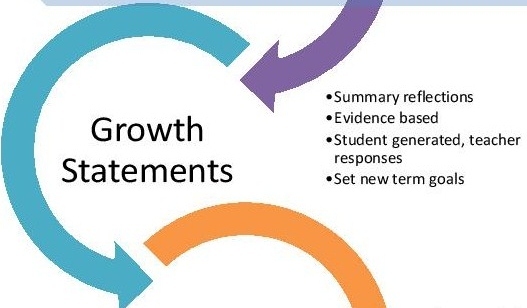 This is the fourth of six articles on the assessment and reporting practice used at my school for the past 15 years This post explores student generated report cards we called, "Growth Statements." While things have evolved over time, and recent changes to our provincial reporting requirements are challenging the way we do things, this is a snapshot of the ideal, our grand goals, and in most cases, the practice. Near the end of the term students begin writing their own report cards. It seems a provocative statement and one would think that students would just give themselves whatever mark they wanted, but that just isn't the case. Throughout the term, students engage in daily work, assignments, and projects. For each, they reflect not only on their academic growth, but their growth as learners: reflecting on process as well as product. Many larger projects are accompanied by in-depth student-reflection on criteria, attitudes, organization, and strategies. Teachers respond to these statements and work with students to determine the extent to which the product met the assignment criteria. Student reflections and teacher responses from assignment to assignment read like a dialogue about the student's growth. Product and reflections are included in the student's portfolio where it become, collectively, a body of evidence demonstrating engagement, growth, understanding, and achievements. At the end of the term, students examine their portfolios and create summary statements that answer the question, "What does this evidence say about me as a learner?" They may further reflect on strategies they employed that contributed to success, understandings of their own learning styles, organizational techniques, etc. Our grade six teachers work extensively with students new to our school to bring them up to speed with the idea of reflecting, and thinking about thinking, learning about learning, about assessing their own work. A goal is to have students see assessment not as something that is done to them, but as something they can do themselves, for themselves. The teacher's role includes helping students make realistic, focused, and evidence-based self-assessments. When students complete their growth statement draft, the teacher reviews it with the student. In cases where a teacher's understanding and overall rubric designation is very different from a student's, a teacher will ask something like, "What evidence were you thinking of when you decided that designation best reflected your term's work?" In the dialogue that follows, teacher and student talk about the evidence in the portfolio, their individual understandings of what it represents. Students may decide to reconsider their assessment, or a teacher may be swayed by the student's thoughts, or they may agree to disagree. Each will enter their rubric designation on the growth statement and that item in particular is raised at the student-led conference. Writing growth statements is a lengthy and involved process, but when viewed as part of the language arts program, there is plenty of justification for pursue this kind of thinking, writing, revisions, and publishing for the parent audience. In the next post in the series, we will explore the student-led conference as it fits within this model of assessment and reporting.